Iowa State University’s Transportation Student Association (TSA) has done it again. For the sixth year in a row, the TSA earned the Institute of Transportation Engineers (ITE) outstanding student chapter award of the ITE’s Missouri Valley Section (MOVITE). TSA members accepted the award at the MOVITE Spring Meeting in Omaha, NE in April. Although the TSA had been doing many outreach activities that helped earn them the outstanding student chapter award in years past, AlBughdadi came into the presidency eager to do even more. The new cabinet came into their leadership roles ready to share responsibility. Rather than the cabinet members organizing the activities, they set up committees made up of a few members for each planned activity. So, instead of 5 people planning their outreach events, there were 25 to 30. Setting up the TSA this way allowed the members to do more activities than in years past. 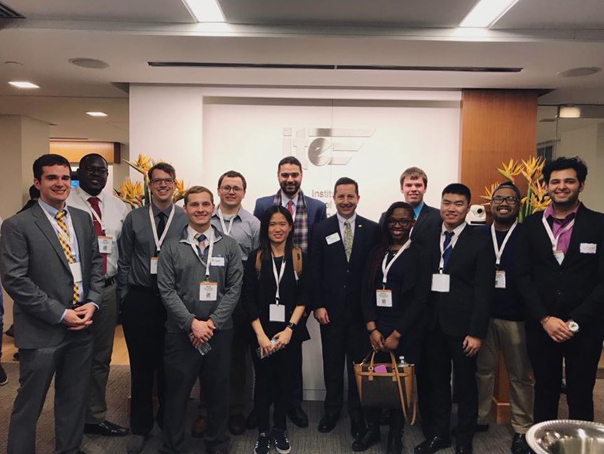 That cooperative attitude not only got more TSA members involved in planning, but it also meant the organization reached out to others to engage in more activities through collaboration with other student groups at Iowa State. Some of the highlights of the group’s activities this year were several workshops, attendance at a number of regional conferences, a roadside clean-up event, and a high school safe-driving class. Jing Dong, assistant professor of civil engineering and TSA student chapter faculty adviser, said she is proud of the group’s achievement. “In the past year, TSA have organized many social and professional activities, including the joint meeting with Iowa Central ITE members and outreach to K-12 students. It is a well-deserved award,” Dong said. The MOVITE section encompasses the states of Iowa, Nebraska, Kansas, Missouri, Oklahoma and Arkansas. The TSA will now submit its annual event report to the Midwest District in the hopes of winning the district best student chapter for the second year in a row. That award will be announced later this summer.